We’ve already reviewed Subscription & Recurring Payments by aheadWorks and this time our attention has been captured by an alternative solution – Subscriptions and Recurring Billing by Exto. 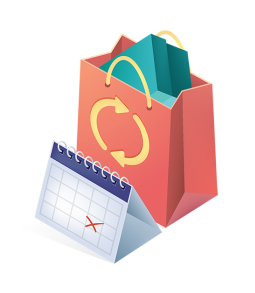 If you are not familiar with the functionality of such Magento 2 extensions, they provide customers with the ability to purchase products on a subscription basis setting up automatic recurring payments. As a result, a customer stays with you for a longer period of time without even visiting your website for repetitive purchases. Why is the Exto.io Subscriptions and Recurring Billing Magento 2 module special? 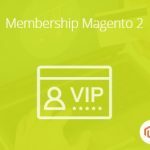 First of all, the extension provides highly configurable subscription templates designed to simplify the default Magento 2 shopping. Besides, your customers can easily checkout with a combination of subscription and non-subscription items. 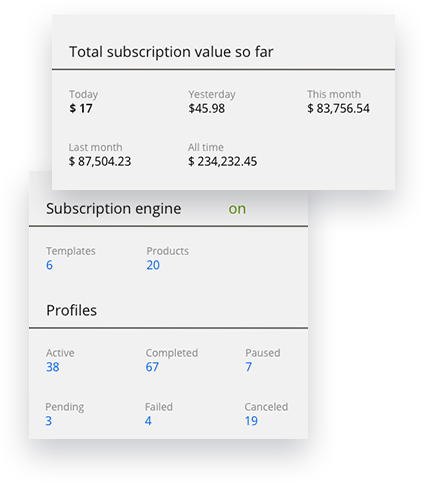 From the backend perspective, the Exto.io Subscriptions and Recurring Billing Magento 2 module allows to get all the necessary information from the improved dashboard that illustrates such key parameters as the number of products that provide a subscription option as well as the profile status of a subscription, etc. Furthermore, the dashboard provides access right to the subscription templates, product catalog, and recurring profiles. As for the smart subscription templates, they are designed with both administrators and buyers in mind. Each template includes all the necessary options (we describe them in the backend section of this post). 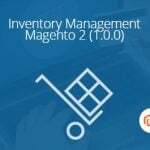 Besides, the Exto.io Subscriptions and Recurring Billing Magento 2 extension supports multiple store view functionality to provide merchants with the ability to sell products on a subscription basis internationally. Note that each template can be applied to either a single product or a complete product line decreasing time expenditures necessary for implementing subscriptions on your Magento 2 website. Moreover, you can simultaneously allow subscription and non-subscription purchases. 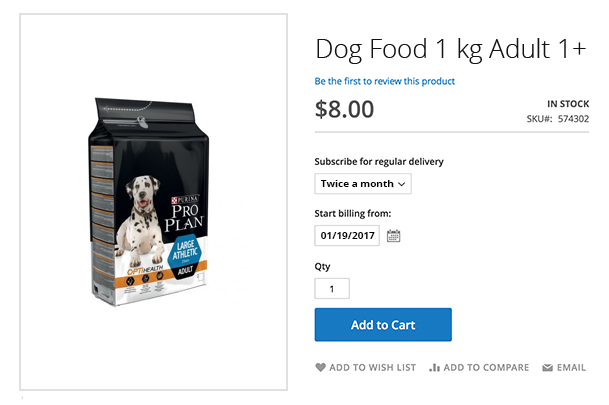 As a result, customers can combine all the necessary goods in one cart and pass the single checkout procedure for both types of products. 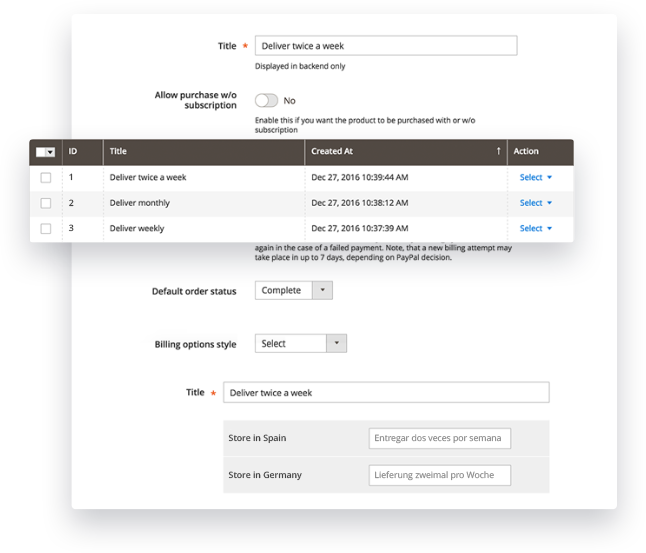 In its turn the Exto.io Subscriptions and Recurring Billing Magento 2 module automatically charges for the non-subscription goods, and then generates profiles for the subscription items. Note that recurring payments are processed via PayPal, which is the most secure provider of this service. 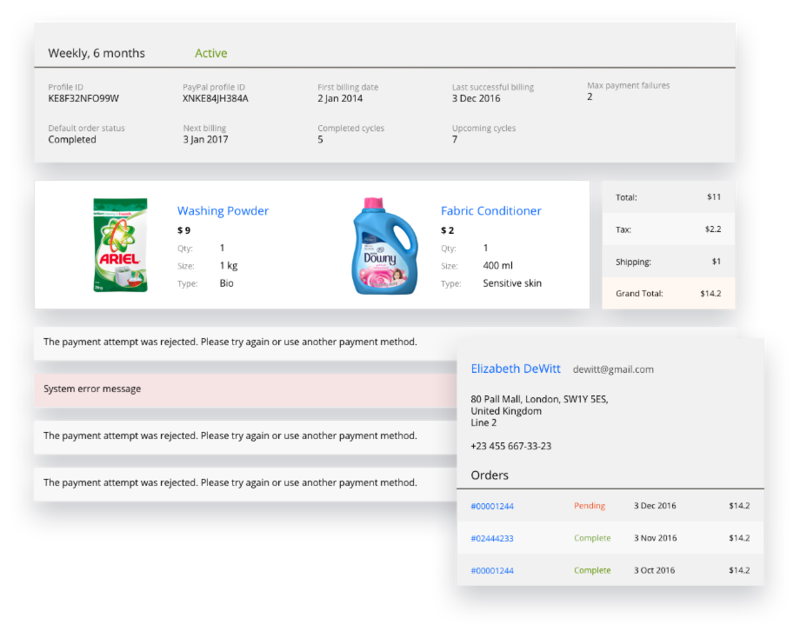 From the customer side, the extension displays such data as selected products (+details), billing periods, the next billing date, as well as the termination date. A customer can cancel subscriptions. The same opportunity is available for administrators in addition to the ability to set subscription status to Suspended. Besides, this status can be used by the system automatically if an error occurs while recharging a payment for a certain amount of times. 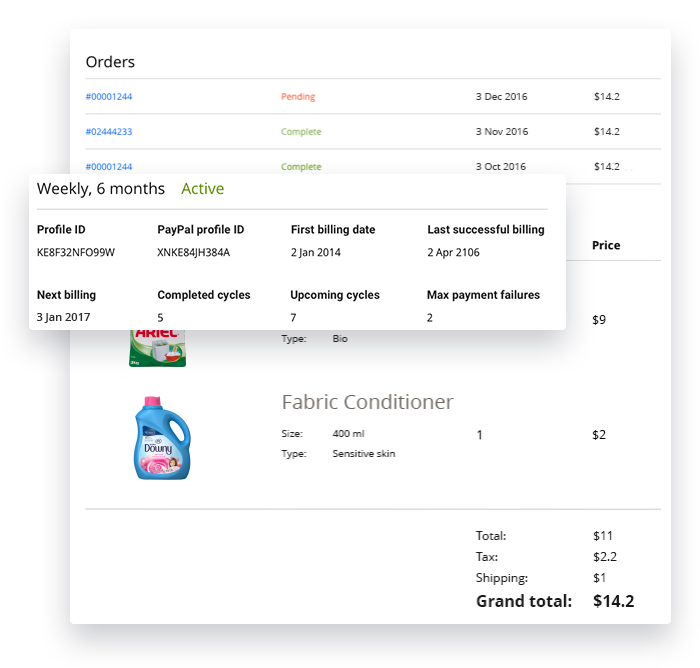 Seamless integration into a product page is another great feature of the Exto.io Subscriptions and Recurring Billing Magento 2 extension. It adds several elements that inherit your default style. 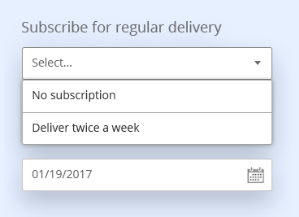 A product page gets a subscription selector (twice a month) and the first billing date chooser. No additional resources are used to implement the service, since it fully leverages the existing ones. A customer can easily order a single item or request a regular delivery on a product page. 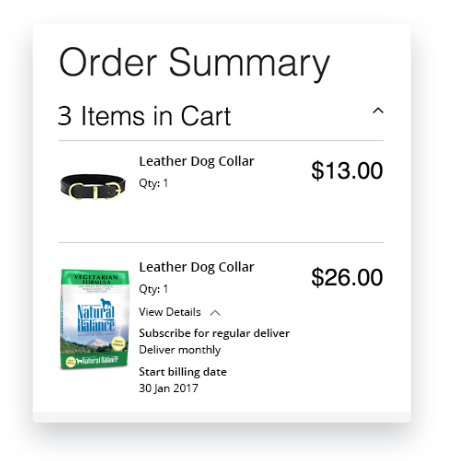 In addition, all the necessary subscription details are displayed in a cart and during the checkout. Thus, subscription items can be always checked, so any stage guarantees successful order completion.